The Liberian regime has no respect for basic Human Rights; or Workers Rights! In Liberia, the government has arbitrarily fired health workers who were on the front lines of the fight against Ebola; simply because they were trying to ensure adequate protection and working conditions for public workers. Before you consider traveling to or investing in Liberia, think about whether you really want to support a regime which treats health heroes as disposable goods. Learn more about how to stand up for the rights of Liberian workers by watching the video above and signing the petition below! In February 2014, Joseph S. Tamba and George Poe Williams were dismissed following a nationwide strike against poor working conditions in the health sector. The strike followed repeated attempts to seek change through negotiations and dialogue, which the government rebuffed. These deplorable working conditions had fatal consequences: the lack of protective equipment, long working hours and the lack of medication in the fight against Ebola caused hundreds of deaths amongst health workers. In addition, the refusal by the government to engage in dialogue with healthcare workers’ representatives no doubt exacerbated the Ebola crisis and contributed to thousands of deaths and a global health crisis. Furthermore, workers who continued risking their lives did not always get their salaries and risk allowances and no consequent support system for Ebola survivor health workers or for the families of deceased workers was put in place. Following the national strike, 22 union leaders across the country were fired without any hearing by the Health Minister of Liberia. Following an intervention by nearly all stakeholders, twenty were reinstated, except for Joseph S. Tamba and George Poe Williams, respectively President and General Secretary of NAHWAL. Their accounts were put on hold as of May 2015. The cases of Tamba and Williams do not stand alone. They are an extreme example of the lack of respect for trade union rights and the right to organise in Liberia although ILO Conventions 87 and 98 are ratified. To date, it remains illegal for public service workers to organise and form or join a union that represents them. Although NAHWAL has followed all the required procedures, including paying Business Registry tax as a trade union for two years in a row, the union has been denied a union certificate. The Ministry of Labour has never officially replied to written requests for clarification. NAHWAL, together with PSI and ITUC has filed a complaint at the Committee on Freedom of Association of the ILO. Not only Liberian public service workers’ organisations but also other unions face the same struggle: various trade unions have been denied registration therefore excluding them from collective bargaining and union leaders and activists are regularly dismissed, displaced to faraway regions, denied their salary, and workers intimidated. On 28 September, the President of Liberia called for the mass dismissal of teachers who participated in protests against public-private partnerships. PSI calls on its affiliates and allies to send letters to the Liberian government, for the reinstatement of dismissed workers, demanding the recognition of the right to organize for public service workers and the respect of trade union rights for all workers in Liberia! 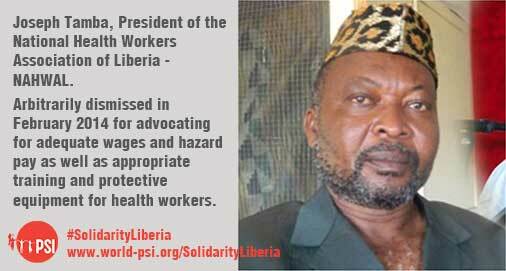 Stand in solidarity with workers in Liberia!
. 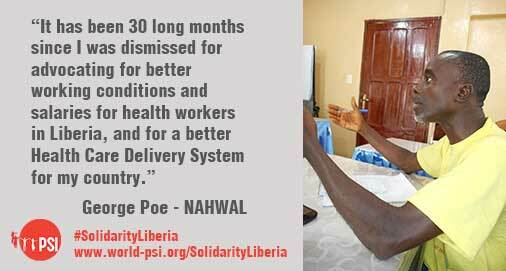 @emansionliberia respect #healthworkers right to organise #SolidarityLiberia.
.@emansionliberia reinstate George Poe & Joseph Tamba NOW! 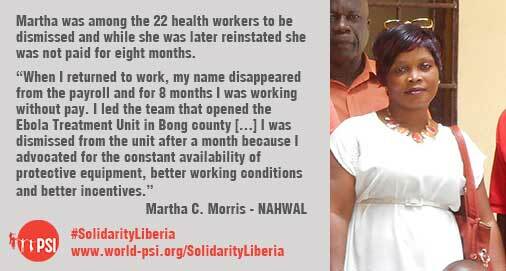 #decentwork for #healthworkers #SolidarityLiberia.
.@emansionliberia it is time to respect #ILOConventions 87 & 98 ratified by #Liberia. Reinstate dismissed #healthcare workers NOW! UN Commission: "New Investments in Global Health Workforce Will Create Jobs and Drive Economic Growth"
Publication: "Safe Workers Save Lives: PSI Health Priorities and Trade Union Response to the Ebola Virus Disease"